March 28, 2018 March 27, 2018 / J.K.
A detailed summary of the book is difficult to do. The subtitle more or less says everything you need to know about the book. 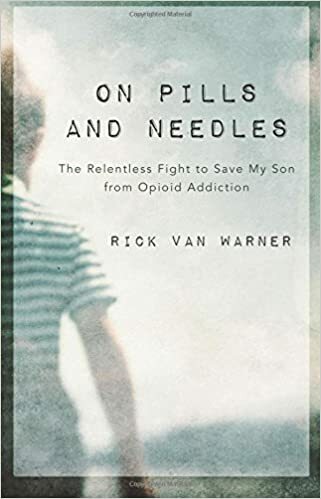 Van Warner writes a first hand account of watching is his son struggle with addiction to opioids, starting as a teenager and extending through his mid twenties. The book is broken into 25 broad chapters that generally follow a chronological pattern of thought, but not always. There are a few bits of information regarding the pandemic that is the opioid crisis, but these are mostly scattered throughout the narrative of his son’s life. If you seeking answer to the problem, or even just the ‘Christian response’ (the publisher is Baker Books, after all), you will not find any in this book. However, if you are somehow lucky enough not to know anyone with this addiction, it is worth the read, if for nothing else than to gain an understanding of what happens, what addiction look like, and the impact of family and friends of the addict. Van Warner is a great writer in a narrative sense, and I found myself compelled to keep reading this book just to see what happens next. It is an emotionally enthralling book, and if you have normal level of empathy and emotions, it is likely you will not get through this book without crying multiple times. That being said, be aware that there is little else to this book than the story of his son. I’m not really sure what I expected when I ordered it, but there isn’t really any resolution or response to the issue. No ‘warning signs’ or way to prevent this from happening. Nothing along the lines of, how to help those hurting or what we should do as a church. All of which is fine, it is clearly not the intention he had in mind while writing this, but be aware if that is the type of book you are looking for. Outside of the lack of resolution, the only thing I didn’t like about the book is the typically evangelical hypocrisy of being anti-government, while blaming the government for not doing enough. While he rightly attributes the initial problem to the Pharma Companies, specifically the one that falsely claimed Oxcy was non-addictive, he does lament the government hasn’t done enough. He also point out that Florida is ground zero of the crisis, with an astonishing 93 of the top 100 opioid prescribing doctors working there. Of course, FLorida is notoriously lax in government regulation and I’m sure this and the low tax (meaning less government) environment is partly what brought him there from New York. He himself doesn’t necessarily rant that much against government in his book, but it is odd to read from the perspective of evangelicals, knowing that most of us are heavily pro-business and anti regulation, inexplicably claiming that the free market couldn’t lead us astray, and then, when they inevitably do, we wonder why the government didn’t help. Those critiques are a little past the realm of this book review, but if you become aware of them while reading, it tends to gnaw at you. Likewise, he blames ‘bureaucracy’ for his son spending two months in county jail, while he supposed to be transferred to another county jail. All this happens in context of his sons possession and intent to distribute charge being dropped. Being dropped. He doesn’t seem to realize how lucky he is that his son is well off and white. Poor people and minorities don’t tend to have felony drug charges just ‘dropped’, but instead spend years in jail. I’m hesitant to leave that in for just a book review, but the author does seem to be misguided often. Regardless, his story is revisiting, if lacking insight in to solutions. I have a colleague whose son is currently in the grips of heroin addiction, after starting with Oxcy. The things the author writes about, the stories, the pain, the interactions with counselors and police, could have come from her. There is a shocking amount of similarity. I’m sure that is the same for many others out there. If you are looking for a story to help you internalize the crisis, this is a must read. It is probably helpful for anyone in pastoral ministry, counseling, or youth/child workers. There isn’t a list of things that parents/teachers can look for as far as signs of drug abuse, but there are gleanings from the detail of his story. For those with any interest in the epidemic that is currently among us, this is a book you need to add to your list.